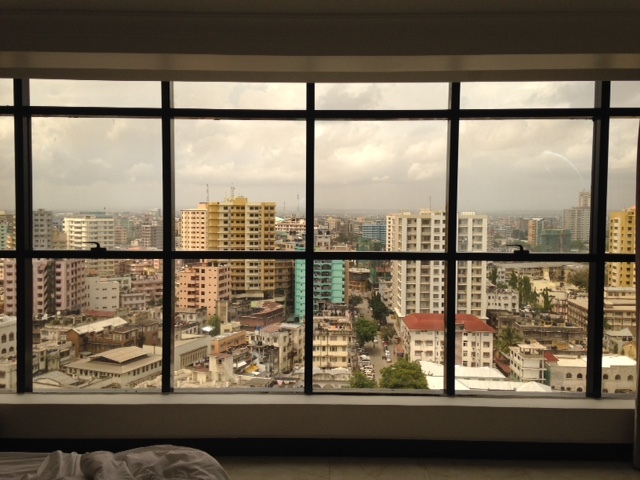 A 2.45am alarm is no-one’s friend, but after a journey with stop-offs in Zurich and Nairobi I woke up to this not too shabby view of muggy Dar es Salaam. I’ve successfully swallowed a malaria pill without getting dizzy, got cash, and set up two appointments at the Ministry of Health and Social Welfare to get another introductory letter, which means things are officially happening. Ish. Still need to sort my old Tanzanian phone and sim, but the clouds looked ominous so I beat a retreat back to my lovely A/C and the view. Tanzania may be an unlikely country in which to make a film about the everyday risk of HIV/AIDS treatment and care for some. As a country with an HIV/AIDS prevalence of 5% it does have a significant epidemic, but this is a much smaller rate than states in Southern Africa such as Zambia (12%), Botswana (25%) and South Africa (18.9%). The politics of HIV/AIDS activism in South Africa arguably make it an even better location country for the film. I have two reasons for situating the film in Tanzania. First, the story of HIV/AIDS in South Africa has been covered in many different outlets from popular books such as Geffen’s Debunking Delusions and films such as Fire in the Blood, to academic publications from authors such as Youde, Chirambo and Fourie, to the numerous excellent cartoons of Zapiro. South African politics is such a rich realm of study that any engagement would require many more years of experience working on and in the country than I have. As with much of South African politics, the story of South Africa’s HIV/AIDS epidemic – the advocacy campaigns, the constitutional court, the TRIPS amendment, Presidential denialism, apartheid politics – is in many ways the exception to understanding the disease on the continent of Africa. Simply put the story of HIV/AIDS in South Africa has been told, from different perspectives, and in better ways that I could do. I wanted to base a film on HIV/AIDS in a different country to South Africa, to show that the politics of HIV/AIDS and everyday risk of treatment and care is not just represented by what happened in South Africa. The second reason for why the film will be set in Tanzania is a practical one. I have been conducting research in Tanzania since I did fieldwork for my PhD 2004-2006. I know parts of the country very well, I understand the structure of HIV/AIDS governance, and have contacts with local community based organisations that operate here. I like Tanzania and if you are going to spend months away from home, your partner, and your backlog of Corrie episodes you may as well go somewhere you like. But more importantly, Tanzania is where my perception on the politics of HIV/AIDS and the everyday risk of treatment and care was formed, through my research and my work with the NGO Trans Tanz. Throughout my PhD fieldwork I became increasingly frustrated at seeing the lack of opportunities for people living with HIV/AIDS to access the anti-retroviral treatment that had been made free for them to take: simply put if you didn’t live near a clinic you had no hope of getting on treatment. Travel was expensive and time-consuming if you lived over two hours from the clinic on bad roads, clinics had long queues and waiting times, and the stigma of attending such clinics was significant. Returning to the UK from fieldwork in 2006 I didn’t know much (okay, anything) about health systems and even less about the debate over horizontal (invest in health systems) versus vertical (invest in specific diseases e.g. malaria, tuberculosis, polio) that had dominated global health governance for the last twenty years, so naively I thought me and some friends could address an issue that global health institutions had wrangled with for years by buying a bus to transport people living with HIV/AIDS to health clinics.. So we did, and thus, Trans Tanz was born in the summer of 2006 is still running today. If I knew what I know now then perhaps I would have realised that the problem of health system strengthening was such a biggie that a small bus would be a pointless drop in the ocean of global health problems: but really I’m delighted at my ignorance, as the cynical academic me who’s now worked on these issues for ten years, with a scepticism over development and NGOs wouldn’t have done anything, and that would have been rubbish as although deeply frustrating at times, I love Trans Tanz. Trans Tanz was never meant to feed into my academic work. However boundaries such as these are always difficult, and visiting Tanzania and meeting with the people who use the bus continues to inform my thinking on global health problems. I never knew it counted as academic impact until my pal Jamie from UUK pointed out that of course it did. Trans Tanz made me interested in the everyday lives and stories of people who are subjected to and shape global health governance. Trans Tanz also made me see the impact of film when two friends Tom and Min made this short film about the bus https://vimeo.com/32975819 and our monthly donors and World AIDS Day contributions went up. Without Trans Tanz and this short film by Tom and Min, this film project would not be happening. Tanzania through the work of Trans Tanz and my wider work on the World Bank, global health governance, and partnerships and participation has shaped much of my thinking on both global health politics and international relations. I know people living with HIV/AIDS here, I know people working in the HIV/AIDS response in different sectors of society and government. Therefore to make a film about HIV/AIDS, Tanzania was the obvious setting.